For Naropa University in Boulder, Colorado, see Naropa University. Nāropā (Prakrit; Sanskrit: Nāropadā or Naḍapāda) (probably died ca. 1040 CE) was an Indian Buddhist Mahasiddha. He was the disciple of Tilopa and brother, or some sources say partner and pupil, of Niguma. As an Indian Mahasiddha, Naropa's instructions inform Vajrayana, particularly his six yogas of Naropa relevant to the completion stage of anuttarayogatantra. Although some accounts relate that Naropa was the personal teacher of Marpa Lotsawa, other accounts suggest that Marpa held Naropa's lineage through intermediary disciples only. According to scholar John Newman, "the Tibetans give Nāro's name as Nā ro pa, Nā ro paṇ chen, Nā ro ta pa, and so forth. The manuscript of the Paramarthasaṃgraha preserves a Sanskrit form Naḍapāda (Paramarthasaṃgraha 74). A Sanskrit manuscript edited by Tucci preserves an apparent Prakrit form Nāropā, as well as a semi-Sanskritic Nāropadā (Tucci 1930:150 & 152)." Naropa was a contemporary of Atiśa. Naropa was born in a high status Brahmin family of Bengal. From an early age showed an independent streak, hoping to follow a career of study and meditation. Succumbing to his parents' wishes, he agreed to an arranged marriage with a young Brahmin girl. After 8 years they both agreed to dissolve their marriage and become ordained. 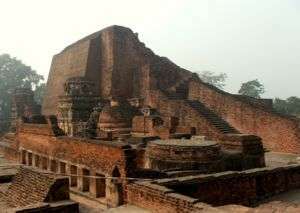 At the age of 28 Naropa entered the famous Buddhist University at Nalanda where he studied both Sutra and Tantra. He gained the reputation of a great scholar and faultless debater, essential at that time as the tradition of debate was such that the loser automatically became a student of the winner. He eventually gained the title "Guardian of the Northern gate", engaged in many debates and taught and won many students. According to his Tibetan namtar, or spiritual biography, one day, while he was studying, a dakini appeared to Naropa and asked if he understood the words of the Dharma, Buddha's teachings. He replied that he did and when she seemed happy with his response, he added that he also understood their meaning. At this point the dakini burst into tears, stating that he was a great scholar, but also a liar, as the only one who understood the teachings was her brother, Tilopa. On hearing the name "Tilopa", he experienced an intense feeling of devotion, and Naropa realised he needed to find the teacher to achieve full realisation. He abandoned his studies and position at the university and set out to find Tilopa. Naropa then underwent what is known as the twelve minor hardships in his quest to find his teacher, all the hardships being hidden teachings on his path to enlightenment. When he finally met Tilopa, he was given the four complete transmission lineages which he then began to practice. While studying and meditating with Tilopa, Naropa had to undergo a further twelve major hardships, trainings to overcome all the obstacles on his path, culminating in his full realisation of mahāmudrā. Naropa spent a total of twelve years with Tilopa. Later in his life Naropa stayed in Phullahari, where he died aged 85. Phullahari or Pullahari was located most likely in eastern Bihar or Bengal. One of the few reliable historical accounts of him comes from a Tibetan translator named Ngatso Lotsawa, who made an effort to visit Naropa at the monastery of Phullahari while waiting to visit with Atiśa at Vikramashila. Because I went alone as an insignificant monk to see the Lord Atisha —— and because he tarried for a year in Magadha – I thought I would go see the Lord Naropa, since his reputation was so great. I went east from Magadha for a month, as I had heard that the Lord was staying in the monastery known as Phullahari. Very great merit arose from being able to go see him. On the day I arrived, they said some feudal prince had come to pay homage. So I went to the spot, and a great throne had been erected. I sat right in front of it. The whole crowd started buzzing, "The Lord is coming!" I looked and the Lord was physically quite corpulent, with his white hair [stained with henna] bright red, and a vermilion turban on. He was being carried [on a palanquin] by four men, and was chewing betel-leaf. I grabbed his feet and thought, "I should listen to his pronoucements!" Stronger and stronger people, though, pushed me further and further from his feet and finally I was tossed out of the crowd. So, there I saw the Lord's face, but did not actually hear his voice. Naropa is remembered for his trust and devotion to his teacher, which, according to his biography, enabled him to attain enlightenment in one lifetime. He is also remembered as part of the "Golden Garland", meaning he is a lineage holder of the Kagyu school of Tibetan Buddhism and was considered an accomplished scholar. A great practitioner, Naropa is best known for having collated the Six Dharmas. These practices help achieve Buddhahood more rapidly. Many subsequent Karmapas have been particularly adept at one or more of these practices, which in Vajrayana tradition are held to have been given by the Buddha and were passed on through an unbroken lineage via Tilopa to Naropa, Marpa and Milarepa and on to the present day. 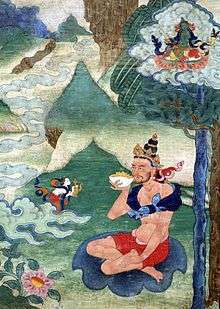 Naropa is considered one of the eighty-four mahasiddhas, the 'saints' of Vajrayana. Naropa University in Colorado, USA was named in his honour. ↑ Davidson, Ronald M. (2005). Tibetan Renaissance : Tantric Buddhism in the Rebirth of Tibetan Culture. New York: Columbia Univ. Press. p. 144-7. ISBN 0-231-13470-3. ↑ Richard Robinson. The Buddhist Religion: A Historical Introduction. ↑ Davidson, Ronald M. Indian Esoteric Buddhism. Columbia University Press, 2003. ISBN 0-231-12618-2. ↑ Davidson, Ronald M. Indian Esoteric Buddhism. pg 317. Columbia University Press, 2003. ISBN 0-231-12618-2.